A NASA spacecraft bound for Jupiter will buzz Earth Wednesday (Oct. 9) to snag a gravity speed boost that will slingshot it toward the largest planet in the solar system. The Juno spacecraft will be within 350 miles (560 kilometers) of Earth when it zooms by our planet at 3:21 p.m. EDT (1921 GMT). It will be passing over South Africa during its closest approach to Earth. "Juno is a large, massive spacecraft," Juno mission principal investigator Scott Bolton with the Southwest Research Institute in San Antonio, Texas, said in a statement. "Even a large rocket couldn't provide enough propulsion to get us all the way to Jupiter, so we are flying by the Earth for a gravity-assist that will provide about 70 percent of the initial boost provided by the Atlas V 551 rocket. The gravity assist essentially provides as much propulsion as a second rocket launch." SwRI officials released a video of the Juno probe's Earth flyby to describe how the spacecraft will use Earth's gravity to help it reach Jupiter. Although 97 percent of NASA staff members are furloughed due to the government shutdown, Juno's mission-critical Earth flyby operations have not been affected. This graphic shows the path to Jupiter for NASA's Juno spacecraft, which launched in 2011 and will arrive at Jupiter on July 4, 2016. The 8,000-pound (3,267 kilograms) Juno probe is the first solar-powered spacecraft to explore the outer solar system, and has three large solar arrays, each of which is the size of a tractor-trailer. It also holds a titanium vault to protect sensitive electronic equipment from the harsh environment around Jupiter. "While we are primarily using Earth as a means to get us to Jupiter, the flight team is also going to check and calibrate Juno's science instruments," Bolton said in the statement. There's a bonus, too. Juno is approaching Earth from the planet's sunlit side, which means it is in a prime position to photograph its home planet from deep space. "Juno will take never-before-seen images of the Earth-Moon system, giving us a chance to see what we look like from Mars or Jupiter," Bolton said. The $1.1 billion Juno spacecraft launched in August 2011 and will reach the Jovian system on July 4, 2016. 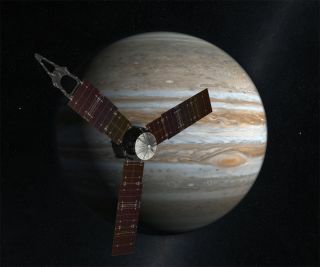 Juno will then orbit around Jupiter for a full Earth year, studying the planet's atmosphere, gravitational field and magnetic field with nine different science instruments, according to the statement. The mission is named after the goddess Juno, from Greek and Roman mythology. In the myth, the god Jupiter (or Zeus, as the Greeks would have it) used clouds to hide his mischievousness, but his wife Juno was able to peer through the veil to see her husband's antics, according to a NASA description. Email Douglas Main or follow him on Twitter or Google+. Follow us @Spacedotcom, Facebook or Google+. Originally published on SPACE.com.